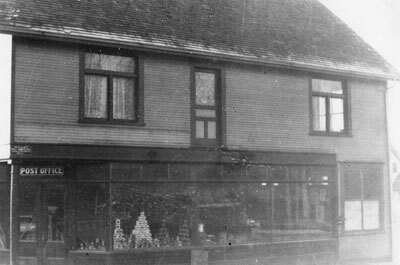 View of West Vancouver's first store, Hollyburn General Store and Post Office, 17th Street and Marine Drive. Original cataloguing note states: "An item under West Vancouver News in The Expressm 7th March 1911 announces the opening of this store for business with Mr. Crearer as Manager, while a second item in the April 4th, 1911 edition of The Express reports that the store at Hollyburn is 'doing splendidly'"
Scanned December 2011 using Epson Perfection V700 Photo at 300dpi and 100% of original image size. Alternate Versions: Lossless TIF from original scan at 300dpi and 100% of original print. W25 x H16 cm black & white print on photo paper.